Flying frisbee®-like discs heading into baskets hanging on poles? Absolutely. Disc golf is hot everywhere and especially in Northern Michigan. Disc golfers head North with their bags of discs with good reason: Disc golfing here is spectacular. Like ball golf, a disc golf game has the same objective: get the dise in the basket with the fewest throws. It's a great sport because it can be played all seasons--yes, winter is a great time for disc golf--it is inexpensive, and it's great exercise. Petoskey's River Road course is regularly groomed using snowmobiles while Boyne City's Avalanche course has lots of use by snowshoers and snowmobilers so is semi-groomed. In Petoskey, (www.visitpetoskeymichigan.com) take your discs to the River Road Sports Complex just south of Petoskey. This 24-hole disc golf course is somewhat flat but challenging with numerous blind holes and dense, well trimmed foliage. Multiple tee pad locations provide options for novice to advanced players. There are many creeks and riverside resting spots plus wildlife, and wildflowers. Directions: River Road Sports Complex is on River Road which begins just south of Petoskey. Once at the Sheridan and US-131 traffic light, go east on Sheridan for .25 miles. Take a right on Clarion St. Follow Clarion for less than a mile to the stop sign at Howard. Go straight across Howard onto what is now River Road. The park entrance is .3 miles south on the left. Hole one begins on the north side of the parking lot beyond the large sign mapping out the 24 holes. Boyne Mountain Resort, in Boyne Falls, has an 18-hole course that begins adjacent to the Eagles Nest Restaurant atop of the Hemlock trail and includes elevation changes and forward and backward tees for both amateur and professional players. During summer months, the first tee can be reached by either a chairlift or hiking. A shuttle is often available at the hotel's front desk or at Boyne Country Sports where golf discs are available for purchase or rental. The expansive views are an effective appetizer for the numerous on site restaurants that will help you refuel after hiking the hills of this challenging course. Directions: Boyne Mountain Resort is just south of Boyne Falls on US-131. A large sign marks the entrance. Follow directional signs to the Mountain Grand Lodge Check in or stop at Boyne Country Sports. 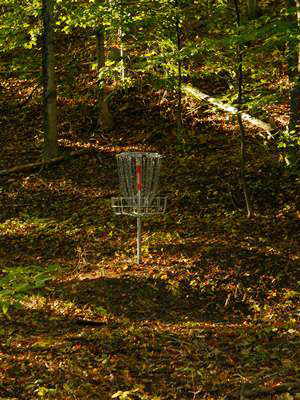 In Boyne City, (www.visitboynecitymichigan.com) the Avalanche Preserve 18-hole disc golf course is an existing hiking trail and is a perfect course for young and older golfers. It begins along the end of the ice rink, reaches a meadow, and continues along a deeply forested climb to the top of Avalanche Mountain where seating, a drinking fountain, and offers views stretching along the length of Lake Charlevoix to beyond Beaver Island. Directions: Avalanche Preserve is at the south end of Lake street a block south of M-75. Take U.S. 131 south to M-75 at Walloon Junction. Follow M-75 along Walloon Lake and into Boyne City. Take a left on Lake St. and follow it to the park at the end of Lake Street. The 1st tee is at east end of parking lot. The Crowle Hole Disc Golf Course at Kiwanis Park in Harbor Springs (www.visitharborspringsmichigan.com) is a spectacular course that weaves through the woods with climbs and vistas of a nearby meadow. The City of Harbor Springs and a small army of volunteers made this course possible. Don't miss it. 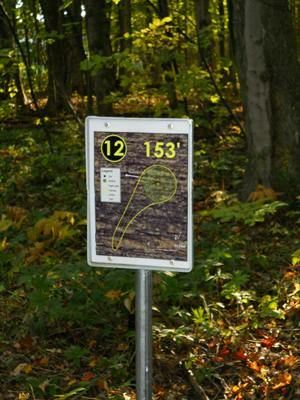 Directions: Crowle Hole Disc Golf Course in Harbor Springs is at the top of the hill on Arbor Street at Kiwanis Park. Come into Harbor Springs on M-119, turn right on the Lake Street (Reynolds Field is on the right), drive one mile to Arbor Street. Turn right and head up the hill. Charlevoix's (www.visitcharlevoixmichigan.com) new Mount McSauba course opened in the summer of 2013. This is a beautiful course wandering through downhill and cross country ski runs with many elevation changes with superb views of Lake Michigan. Directions: Mount McSauba is located on the north side of Charlevoix. Turn on Burns Street (at Charlevoix State Bank), and continue straight onto Mt. McSauba Rd. Follow to the Ski Lodge and parking. Day trip golfers willing to travel an hour can find courses sprinkled through most northern Michigan lakeshore communities. Try south to Traverse City, Cadillac and Kalkaska and north across the Mackinac Bridge to St Ignace. You can enjoy 13 spectacular championship courses within 70 scenic miles. Course locations and details can be found at PDGA. Want to watch or play in a disc golf tournament? There are disc golf tournaments as part of Morel Fest, the National Cherry Festival, and Blissfest: Northern Michigan Festivals & Events.